The battle to keep your brains from getting eaten by zombies has never looked quite so adorable. And yet, Microgaming manages to pull it off without a hitch, showing a good artist can make anything look good. It is a story we heard many times before. A run-down city after the apocalypse struck, with hordes of shambling horrors roaming the streets, looking for brains. But here, Microgaming turns the concept on its head, making for some goofy and adorable looking zombies. A new evolution to draw in victims or an artist having a bit of fun? We will let you decide. 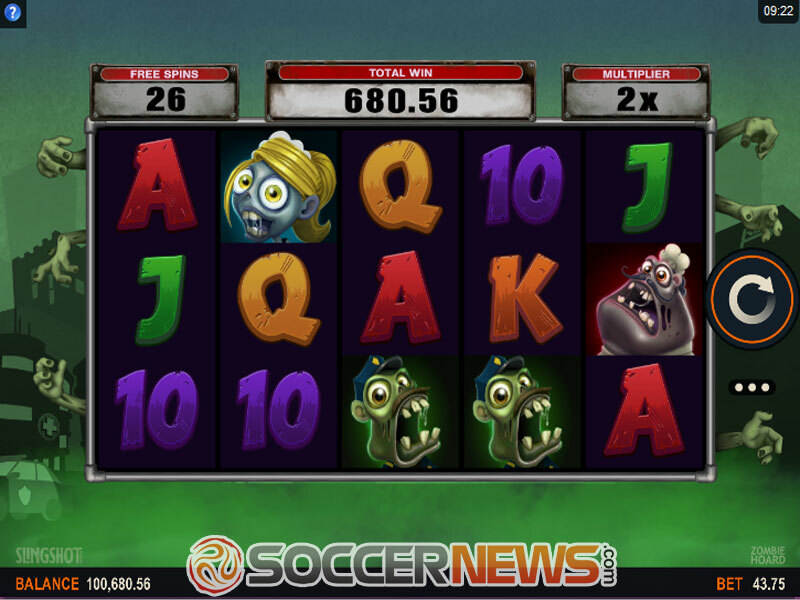 Zombie Hoard is a 5-reel, 3-row video slot which offers 9 fixed paylines. Set in an abandoned city overrun by zombies, players will have to avoid the decaying creatures to survive. And if it just so happens that we make off with some extra loot, we will not mind one bit! 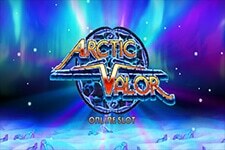 To help that process along, we have super stacked Wilds and free spins with all wins doubled! 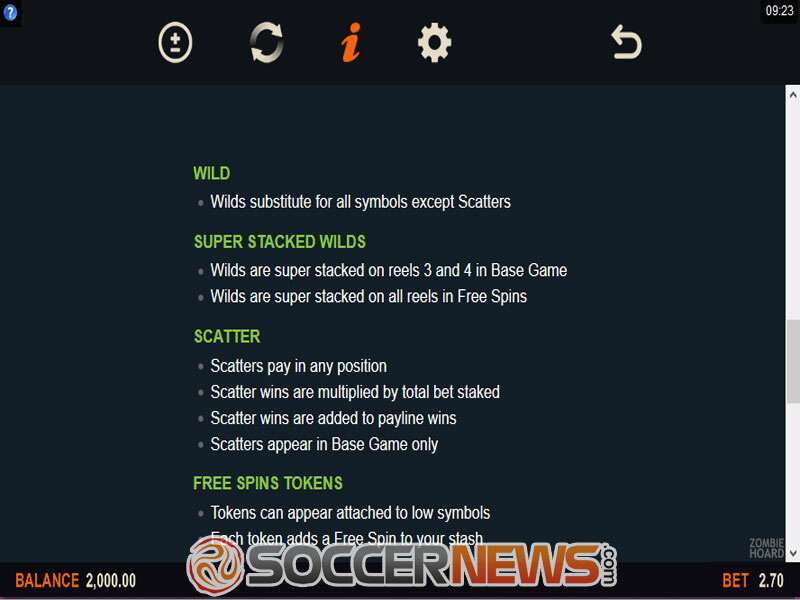 Opening the menu above the spin button, gamblers can selectexisting options, or manually adjust coin size and line bet. 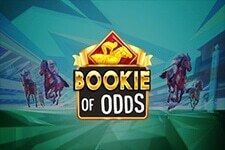 Total bet can be as low as $0.09, and as high as $45 per single spin. Despite being set after a zombie apocalypse, the city feels quite welcoming. It is hard to immerse yourself in an oppressive atmosphere. Not when zombies clap for every win you make and these upbeat tunes keep us in a good mood. Symbols are split into higher and lower paying tiers. 10, J, Q, K and A make up the lower ends of the paytable. Higher paying symbols include different types of zombies: maids, police officers, nurses and chefs. 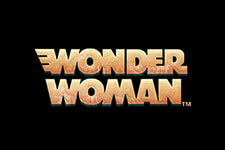 The game’s logo is Wild that substitutes for all icons except for Scatters. A slightly eaten human brain is Scatter used to trigger free spins. Wilds on the third and fourth reel of the playing field appear super stacked during normal gameplay. When players trigger free spins, Wilds can appear super stacked on all five positions. Free spins can be won in two ways. Either collect three or more Scatters or collect a total of 30 brain tokens. The tokens can only appear attached to low paying symbols. 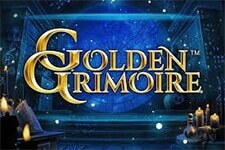 Up to 34 free spins can be played in total. On top of Wilds appearing super stacked on all five reels, all wins are also doubled while free spins last. Zombie Hoard is a medium volatility title with an RTP of 95.29%. 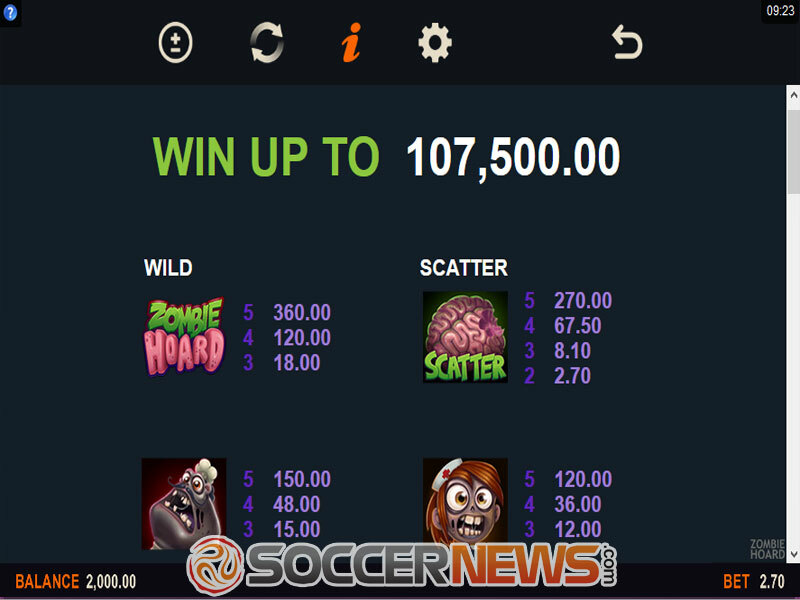 The maximum win you can get is worth 2,388x your total stake. 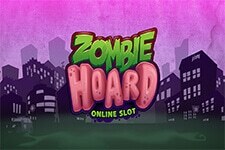 Visit any Microgaming-powered online casino and find Zombie Hoard. Meet cute zombies and avoid getting your brains eaten! "We did not expect this type of art-style for Zombie Hoard, but we quickly got used to it. It certainly stands out visually, as a result. Not many slots try to do cute zombies, after all. But while the graphics were good, the gameplay is on the simplistic side. 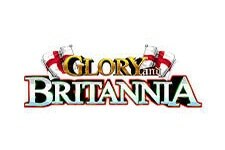 Admittedly, the maximum prize of 2,388x your total bet is hard to pass up on!"